Convento Miranda offers 36 different rooms that were renovated in 2015: 3 single rooms, 29 double rooms and 3 triple rooms as well as a junior suite. All of them are fitted with all the latest facilities. They all have central heating and free Wi-Fi, and they stand out because of their tranquillity and functionality. Double rooms for single use designed to offer our guests maximum comfort. They have a 90 cm bed and a desk. Every private bathroom has a shower, a sink and a toilet. 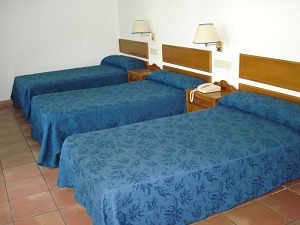 Room with two twin beds or a 135cm double bed, for a maximum of two guests. The private bathroom has a shower, a sink and a toilet. Here, our clients will find the rest and tranquillity they are looking for. Rooms with capacity for a maximum of 3 people. The private bathroom has a shower, a sink and a toilet. Perfect functional spaces to relax and have a rest after visiting all those sites in the city.